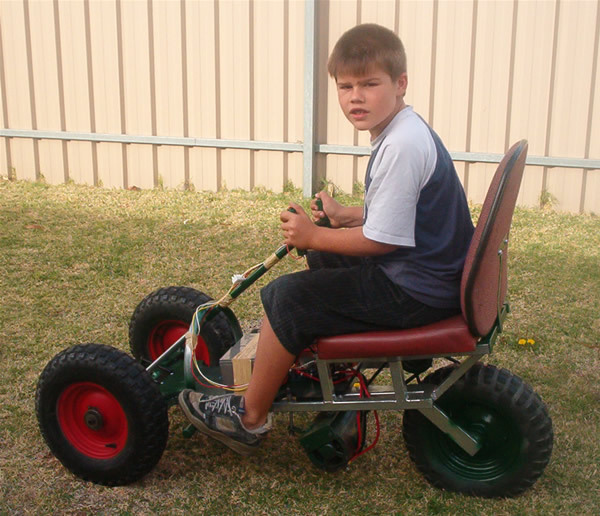 This electric Go-Cart was built completely from roadside junk over a year period and was completed in 2001 as the result of a challenge I had with the young man in the photo. He didn't believe anything was really fun or cool unless it was new and cost money, so after some discussion the challenge was to help him build a go-cart entirely out of road-side junk. One of my most fond childhood memories is the rumble as a dozens of kids racing down the road on billy-carts, made from a hodge-podge of road side junk in the 70's. The junk in those days was not much different to what we see today, but we always found ways to cobble something mobile together and role down a hill on it. Unfortunately, today flocks of kids riding down the middle of Suburban Streets without a helmet and breaks is very much frowned upon. Frame made from cut up furniture and other scrap metal found about. Single gear drive made from two washing machine pulleys and a car fan belt. Two tyres found on a broken sack-truck, the other on a wheel barrow. Seats where used from two different chairs. Horrifyingly bad steering and stability, wheel spins when taking off from a stand-still and very dubious braking, batteries went flat in 15 minutes and took 12 hours to charge - all in all, a great success!